It's likeable and free-spirited, but by most measures I'd struggle to call it good. I often got a bit bored. However I think calling it "bad" or "awful" would be to miss the point. It is what it is. It's a road movie. Plot and characterisation just aren't something it's that interested in. It's set in a mildly psychedelic near-future Japan, where a giant robot superhero apocalypse (the Great Tokyo War) brought down society about ten years ago. Civilisation is still doing quite nicely, but Japan's broken up into ten regions that have declared independence from each other. Conflicts are resolved by symbolic battles between superhero mercenaries (called Bests), who carry pink heart-shaped stones ("moonlight stones") that may or may not be the source of their powers. Each side hires a Best by offering the standard fee of another moonlight stone (do they need more than one? ), then regards the fight's outcome as a legally binding judgement in whatever the dispute happened to be. I still can't wrap my head around that. It's insane, albeit a good kind of madness that makes the show's world more interesting to think about. You might as well base your legal system on coin-tossing, although of course doing that would deprive the anime of spectacular fight scenes. Our heroine is a Best! No, it's not. It's the Best's best friend, who's going to turn into a biker chick and ride off across the country with three friends. They're all normal people (called Rests), but they're going to stand in for their hospitalised Best friend and resolve people's conflicts! The show's a treat to look at. It's quite loose, free animation with lots of style and spectacular use of colour. There are also lots of eyeball kicks, from amazing war relics dominating the horizon to a defeated superhero lying in a heart-shaped crater. Realistic? No. Witty and playful? You bet. The writing's also friendly and good-natured. I never thought anyone's enemies were villainous, instead of just being friends who hadn't realised it yet. My favourite thing about it, personally, was its road trip nature. They're touring Japan, visiting the regions and having fun adventures in Nagoya, Kyoto, Hiroshima, etc. (No Osaka, surprisingly.) The localisation is charming. The accents are always a treat to listen to, although the less said the better about the failed attempt to construct English equivalent in the subtitles I saw. They combine traditional stuff (trainee geisha, those weird tiger-carp castle carvings, etc.) with modern (the Suzuka motorsport race track in Mie, Kinji Fukasaku's Battles Without Honor and Humanity movie series set in Hiroshima, etc.) You've got to love the shamisen + electric guitar rock concert at the end of ep.8. The food on display is special too. I'm afraid it probably helps to have a certain level of Japanese knowledge to recognise all this localisation, though. However the characters are liable to be badly introduced, characterised en passant and/or not particularly important to the stories. The four main girls spend half the series as a sort of four-headed blob, with very little to distinguish them. They're likeable, but they're not very important to what the show's doing. When some of our heroines break off from the group in the last few episodes, I found it hard work to keep track of who's who and whether any given on-screen girl was meant to be one of the regular cast or a supporting character. Similarly the stories are often just throwaway adventures in whatever prefecture our girls have most recently arrived in. Eventually, a sort of plot develops around one of the girls. There's some fairly interesting backstory that explains things in the early episodes. That's quite good. However it's all low-urgency, this being a show without any real baddies, and you're so confident that everyone's going to be friends in the end that it feels silly to call the last episode a climax. I'd describe it more as an unravelling. Ep.9 is actually good, with quite a subtly written argument between two of the main cast, a temporary parting of the ways and some revelations that transform one of the girls into an actual character (as opposed to being just a quarter of the blob). I liked ep.9. However the other eleven episodes are more freewheeling and inconsequential. Would I recommend this? No, but it reminds me of a more forgettable, lightweight Cowboy Bebop. They have similar strengths, i.e. imaginative but throwaway stories that don't matter, full of spirit and style. 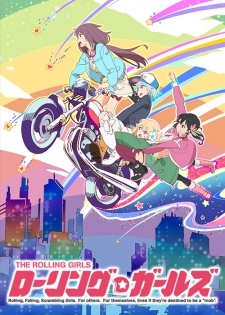 The Rolling Girls doesn't compare musically, but it's more charming. I liked all the cast, which I certainly wouldn't say of Cowboy Bebop. It's a nice world to spend time in, with a pleasing level of madness. I'm quite fond of it, but I can't pretend I found it riveting. It's kind of pointless, really.